The Year of Adam Jones? Over the weekend, the Orioles added Vladimir Guerrero. This development gives the Orioles a lineup heavy on name value, as the team could field a starting nine with Derrek Lee, J.J. Hardy, Nick Markakis, Brian Roberts, Matt Wieters, Mark Reynolds, Guerrero, Luke Scott, and Adam Jones. The latter is perhaps the most intriguing player not named Wieters. Despite only being 25, it feels like Jones has a half-dozen seasons under his belt at the big league level — and he will after the 2011 season. 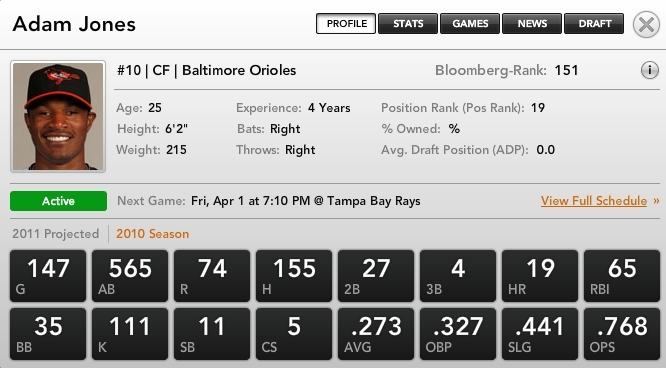 Since becoming a regular with the Orioles, Jones is averaging a line of .278/.324/.343, above league-average rates, but one thing to take away from Jones is the predictive power of the hot hand. In more precise terms: There is no little to no predictive value. Depending on the narrative one wants to establish, Jones either needs to be more prepare to start the season or he finally got comfortable around midseason. Either way, it will lead to skewed views on just how valuable Jones should be viewed entering the 2011 season. The key is to look at the final product rather than how Jones got there unless there’s a reason (injury, mostly) to think one month is more indicative of his talents than another. With respects to others, this means look beyond the last 10 days or three weeks of performance. In Jones’ case, do not expect a drastic step forward in performance. The typical hitter will gradually improve through his late 20s before beginning a decline, keep a conservative projection in mind for Jones rather than using his last month or two as the base line in order to avoid disappointment when it turns out he simply had a well-time hot streak. Projection systems (like the one that generated the above projection) are heartless and emotionless. They are, undoubtedly, better at projecting players than human beings. When in doubt, trust the cold grip of a projection system above your gut and you’ll be less likely to suffer disappointment from under performing players.